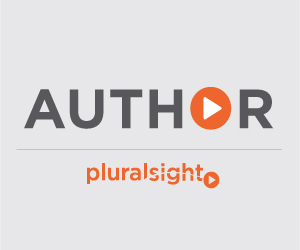 June 2015 – C++ and more! 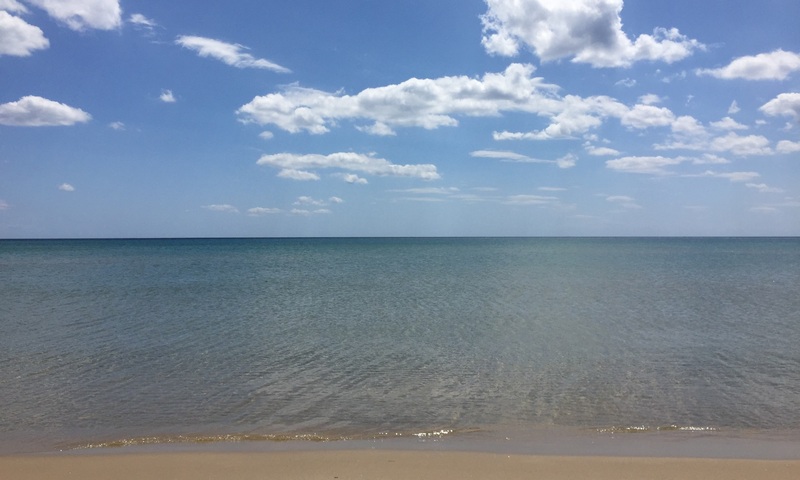 The Sticky Preprocessor-Based TCHAR Model – Part 2: Where’s My Function?!? In the previous blog post, I briefly introduced the TCHAR model. I did that not because I think that’s a quality model that should be used in modern Windows C++ applications: on the contrary, I dislike it and consider it useless nowadays. The reason why I introduced the TCHAR model is to help you understand what can be a very nasty bug in your C++ Windows projects. class std::allocator<char> > __cdecl Utils::GetTempPath(void)"
So, the linker is complaining about the Utils::GetTempPath() function. Then you may start going crazy, double- and triple-checking the correct spelling of “GetTempPath” inside your Utils.h header, inside Utils.cpp, inside Main.cpp, etc. But there are no typos: GetTempPath is actually spelled correctly in every place. Then, you try to rebuild the solution inside Visual Studio one more time, but the mysterious linker error shows up again. What’s going on? Is this a linker bug? Time to file a bug on Connect? It’s just the nasty preprocessor-based TCHAR model that sneaked into our code! Let’s try to analyze what’s happened in some details. In this case, there are a couple of translation units to focus our attention on: one is from the Utils.cpp source file, containing the definition (implementation) of Utils::GetTempPath. The other is from the Main.cpp source file, calling the Utils::GetTempPath function (which is expected to be implemented in the former translation unit). In the Utils.cpp’s translation unit, the <Windows.h> header is included. This header brings with it the preprocessor-based TCHAR model, discussed in the previous blog post. So, a preprocessor macro named “GetTempPath” is defined, and it is expanded to “GetTempPathW” in Unicode builds. Think of it as an automatic search-and-replace process: before the actual compilation of C++ code begins, the preprocessor examines the source code, and automatically replaces all instances of “GetTempPath” with “GetTempPathW”. The Utils::GetTempPath function name is found and replaced as well, just like the other occurrences of “GetTempPath”. So, to the C++ compiler and linker, the actual function name for this translation unit is Utils::GetTempPathW (not Utils::GetTempPath, as written in source code!). Now, what’s happening at the Main.cpp’s translation unit? Since here <Windows.h> was not included (directly or indirectly), the TCHAR preprocessor model didn’t kick in. So, this translation unit is genuinely expecting a Utils::GetTempPath function, just as specified in the Utils.h header. But since the Utils.cpp’s translation unit produced a Utils::GetTempPathW function (because of the TCHAR model’s preprocessor #define), the linker can’t find any definition (implementation) of Utils::GetTempPath, hence the aforementioned apparently mysterious linker error. This can be a time-wasting subtle bug to spot, especially in non-trivial code bases, and especially when you don’t know about the TCHAR preprocessor model. You should pay attention to functions and methods that have the same name of Win32 APIs, that can be subjected to this subtle TCHAR preprocessor transformation. A simple repro solution can be downloaded here from GitHub. If you have been doing a fair amount of Win32 programming in C++, chances are good that you have been exposed to some basic APIs like SetWindowText. The LPCTSTR typedef is equivalent to const TCHAR*: it basically represents a pointer to an input NUL-terminated string. The purpose of this API is to change the text of the specified window’s title bar, or the text of the control (if the hWnd parameter represents a control) using the string passed as second parameter. But, truth be told, there’s no SetWindowText function implemented and exposed as a Win32 API! There are actually two slightly different functions: SetWindowTextA and SetWindowTextW. So, basically, the main difference between these two functions is in the string parameter: the function with the A suffix (SetWindowTextA) expects a char-based string, instead the function with the W suffix (SetWindowTextW) expects a wchar_t-based string. These char-based strings are commonly called “ANSI” or “MBCS” (“Multi-Byte Character Set”) strings. The “A” suffix originates from “ANSI”. Conversely, the wchar_t-based strings are commonly called “wide” strings, or Unicode strings. And, as you can easily imagine, the “W” suffix stems from “wide”. The ANSI/MBCS form refers to legacy strings, with lots of associated potential problems including mismatching code page mess. The Unicode form is the “modern” one, and should be the preferred form in Windows applications written in C++. Note that, in this context, the particular Unicode encoding used is UTF-16 (with wchar_t being a UTF-16 16-bit code unit in Visual C++). So, it’s clear that SetWindowText is just a preprocessor #define, expanded to SetWindowTextW in Unicode builds (which have been the default since VS2005! ), and to SetWindowTextA in ANSI/MBCS builds (which IMHO should be considered deprecated). The Unicode vs. ANSI/MBCS mode is controlled by the UNICODE preprocessor label. As already written, Unicode builds have been the default since VS2005; anyway, you can change the build mode via the Visual Studio IDE, following the path: Project Properties | Configuration Properties | General | Character Set (as described, for example, in this StackOverflow answer). 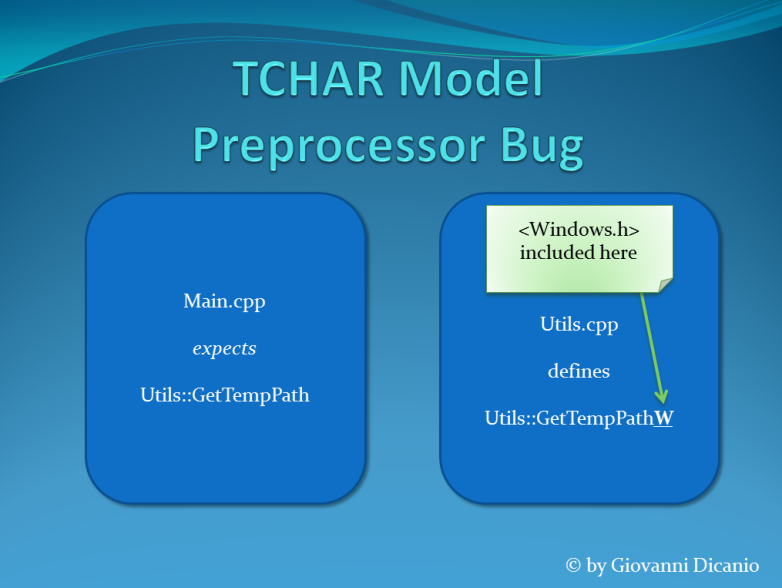 The idea of this legacy TCHAR model is to basically allow C/C++ Win32 programmers to have a single code base, using a common “generic” character type named TCHAR (instead of explicitly using char and wchar_t), and a single apparent function name (for example: SetWindowText), and have this TCHAR expanded to either char or wchar_t, and the proper corresponding A-ending or W-ending function be called, depending on the particular ANSI/MBCS or Unicode build mode setting. In this model string literals should be decorated with TEXT or _TEXT or _T, such that in ANSI/MBCS builds those literals are expanded, for example, as in “Connie”, instead in Unicode builds an L prefix is automatically added, making it L“Connie”. So, given a single code base, you could switch the build mode between Unicode and ANSI/MBCS, and automatically get two different binary executables: one Unicode-enabled, and the other one using the ANSI/MBCS legacy APIs. Anyway, considering that recent widespread versions of Windows, like Windows 7, are Unicode-enabled, there’s really no reason nowadays to use this legacy messy TCHAR model: just build your Windows C++ applications in Unicode. However, this TCHAR preprocessor-based model has some nasty effects still today, as we’ll see in the next blog post. Suppose to have a Unicode character that is a precomposed character, i.e. a Unicode entity that can be defined as a sequence of one or more characters. For instance: é (U+00E9, Latin small letter e with acute). This character is common in Italian, for example you can find it in “Perché?” (“Why?”). This é character can be decomposed into an equivalent string made by the base letter e (U+0065, Latin small letter e) and the combining acute accent (U+0301). So, it’s very reasonable that two Unicode strings, one containing the precomposed character “é” (U+00E9), and another made by the base letter “e” (U+0065) and the combining acute accent (U+0301), should be considered equivalent. calling wcscmp(s1, s2) to compare them returns a value different than zero, meaning that those two equivalent Unicode strings are actually considered different (which makes sense from a “physical” raw byte sequence perspective). then the return value is CSTR_EQUAL, meaning that the two aforementioned strings are considered equivalent, as initially expected.